Gosh, we do spoil you with all these iPad leaks, don't we? And we haven't just been dealt one bunch of new this time, but two sets of sneaky snaps that may give us an early preview of Apple's pair of tablet offerings. First, the iPad 5 (or just iPad, as it will probably be called). FanaticFone posted images bragging to be that of Apple's next full-sized tablet, suggesting it'll slim down and take some design cues from its mini model. 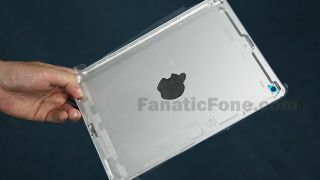 The pictures show the outer casing for the full-sizer and flaunt a very iPad mini-esque in the design of the tablet's rear, falling in line with the rumours we've been hearing. The dimensions of the case are said to be shorter at 9.45 x 6.61 inches, while the distance between the border and screen will be just 3mm. Which brings us to the iPad mini 2. Fanatic Fone, equally enthused about tablets is seems, also showed us what it claims to be the outer casing for the diminutive device, again displaying that all-too-familiar embedded Apple logo. If this is the real McCoy, we can see that Apple isn't changing much in terms of the physical design here: the rear camera, volume buttons and dock connector are all present and positioned as we'd expect. However, we have to douse the fire a little on both of these and point out the cases lack the "iPad" name emblazoned on the back, along with the regulation certifications. This means we could be looking at a couple of early prototypes, pre-branded production models, or some entirely fake wannabes. Worth bearing in mind, that.